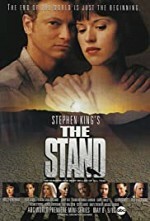 Watch The Stand: When a government-run lab accidentally lets loose a deadly virus, most of the population of the world is wiped out. Survivors begin having dreams about two figures: a mystical old woman, or a foreboding, scary man. As the story tracks various people, we begin to realize that the two figures exemplify basic forces of good and evil, and the stage is set for a final confrontation between the representatives of each.